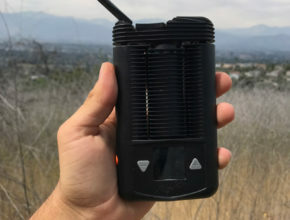 Ranked #1 portable vaporizer by many critics in the vaping industry, we put the Mighty vape to the ultimate test to see if it lives up to the hype. The origin of this legendary vaporizer, takes us to Tuttlingen, Germany. In the city of Tuttlingen, lies the world’s first medicinal herb vaporizer factory. This factory is owned by one of the most well-known brands of vaporizers known to mankind, “Storz and Bickel”. As a leader in the dry herb vaping industry, you will find recognition in many of Storz and Bickel’s vaporizers. Storz & Bickel’s original Volcano vaporizer was an industry 1st and considered one of the earliest high-end desktop vapes. The Volcano is mentioned in the 2008 documentary Super High Me. 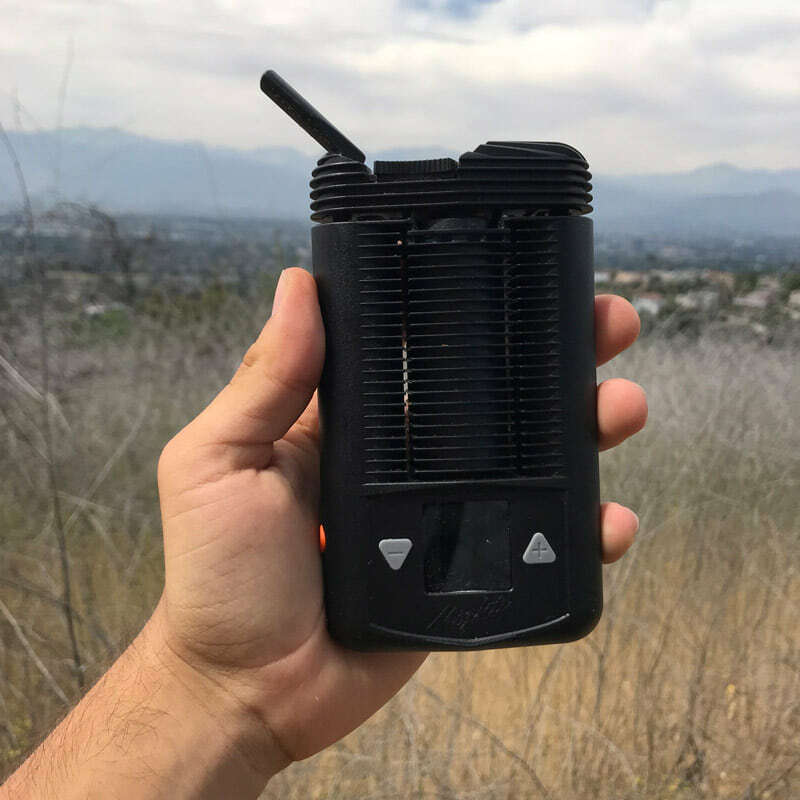 Named “The Mighty”, this portable vaporizer definitely came into our hands with a cocky attitude. With a 90-second heat up time, a wide range of temperature settings (104 – 410 F or 40 – 210 C), dual conduction/convection heating element, a funnel to aid shaky hands with packing the bowl, and a hype for its pungent punch, the Mighty definitely brings mightiness to the table! The Mighty is designed primarily for use with dry herb and loose leaf vaping, but can also vape wax and cannabis concentrates. 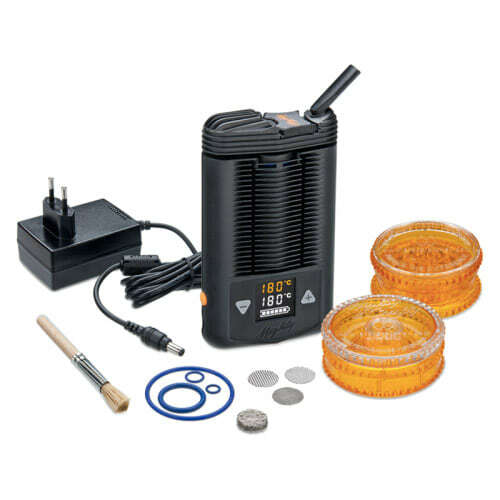 The Mighty dry herb and concentrate vaporizer features a dual convection and conduction heating element. Conduction releases vapor by heating up the aluminum walls that make direct contact with the cannabis. In contrast, convection vaping works by pulling hot air through loose leaf cannabis in the heating chamber. Because the Mighty uses both methods of heating, this vape allows for near maximum efficiency. It does an excellent job of transferring those precious cannabinoids (like THC and CBD) and terpenes that give different cannabis strains their unique bouquet of smells, flavors and high effects. 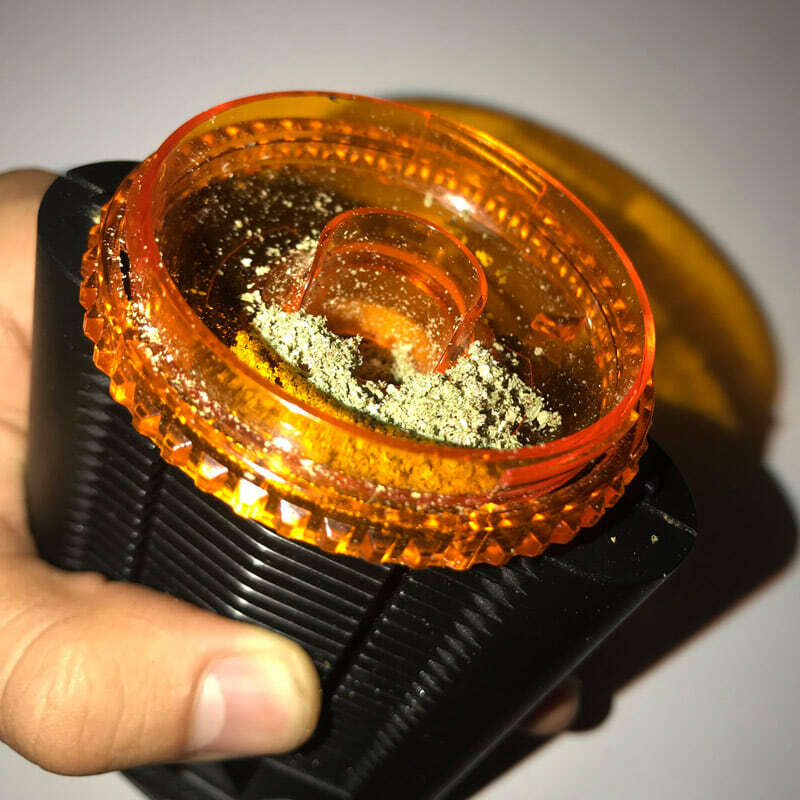 The heating chamber oven has a large capacity capable of holding up to 0.3 grams of coarsely ground flower (the Magic Flight Launch Box’s Finishing Grinder enables this grind consistency) or up to around 0.7 grams of finely ground flower. From a visual standpoint, the Mighty is bulky and lacks the sleek finish associated with other dry herb vaporizers such as the PAX vape or V2 PRO Series 7 combo vape. 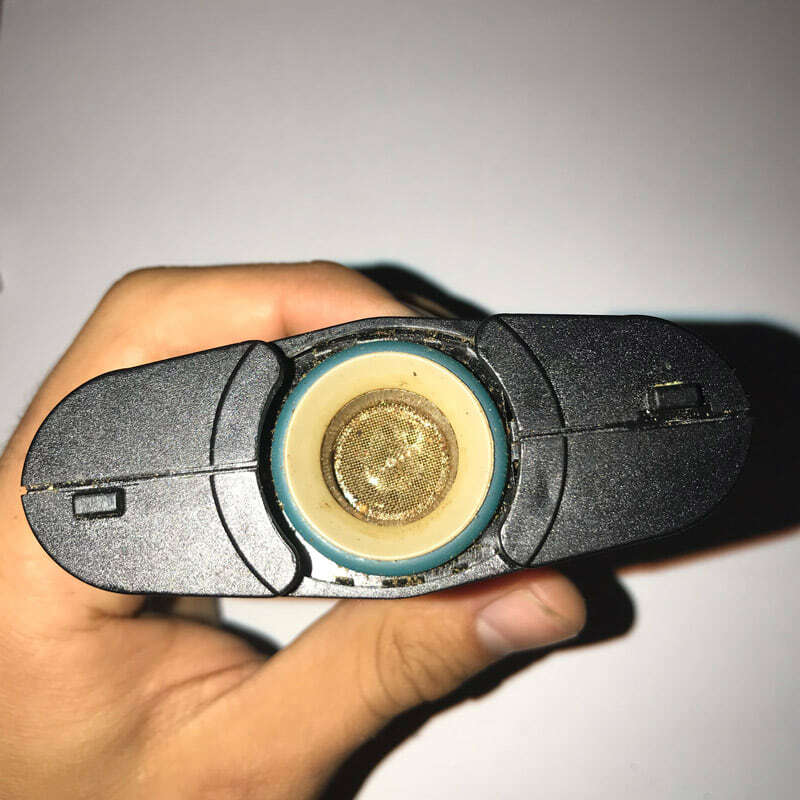 The high use of plastic materials in the Mighty vape’s design may also give off a “cheap” feel when the product is in your hands. However, the Mighty is made with high quality plastics. Despite also having a plastic-based, cooling element, there is little to no residual taste of plastic upon inhale. The built-in cooling element also allows for smooth inhales by significantly reducing the temperature of hot vapors. The plastic used is high-grade plastic. Storz & Bickels products are certified, meeting the standards for quality management systems (according to ISO 9001 and 13485 which fulfills the essential safety requirements for manufacturing vaporizing devices). One of the most appreciated aspects of The Mighty is the easy ability to inhale huge amounts of vapor without having to learn the “proper technique”. Some advanced vaporizers take some “getting the hang of” to get clean, full draws. Some dry herb vaporizers will only produce vapor when drawn slowly, whereas some will require a faster pull. The Mighty, on the other hand, will begin produce consistent vapors at any speed or intensity of inhale. Any great vaporizer should be simple to use and should have a consistent experience like the Mighty. Right out of the box, The Mighty is full of life and ready to go with a charged battery. If your Mighty vape may arrives discharged, it takes approximately two hours to fully charge from start to finish. The Mighty uses pass-through charging meaning you can use the vape while its charging. Although, this is not recommended for prolonged use as it can damage the battery. 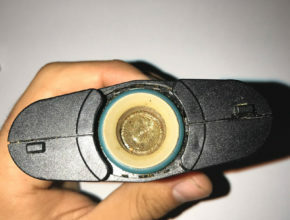 To turn on The Mighty, simply press the orange button located on the lower left side of the vape. You will feel/hear a vibration and the LED screen will light up. The handiness of the orange funnel is a true blessing to any consumer with unsteady hands. Simply twist on the orange funnel above the bowl. 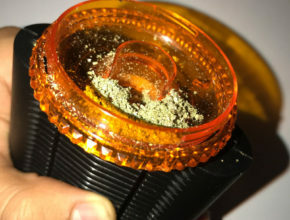 Next, begin grinding up the flower and emptying it onto the Funnel, while scooping/pushing the grounded flower into the middle of the funnel and directly into the chamber. Once The Mighty is packed and powered on, set your desired temperature. 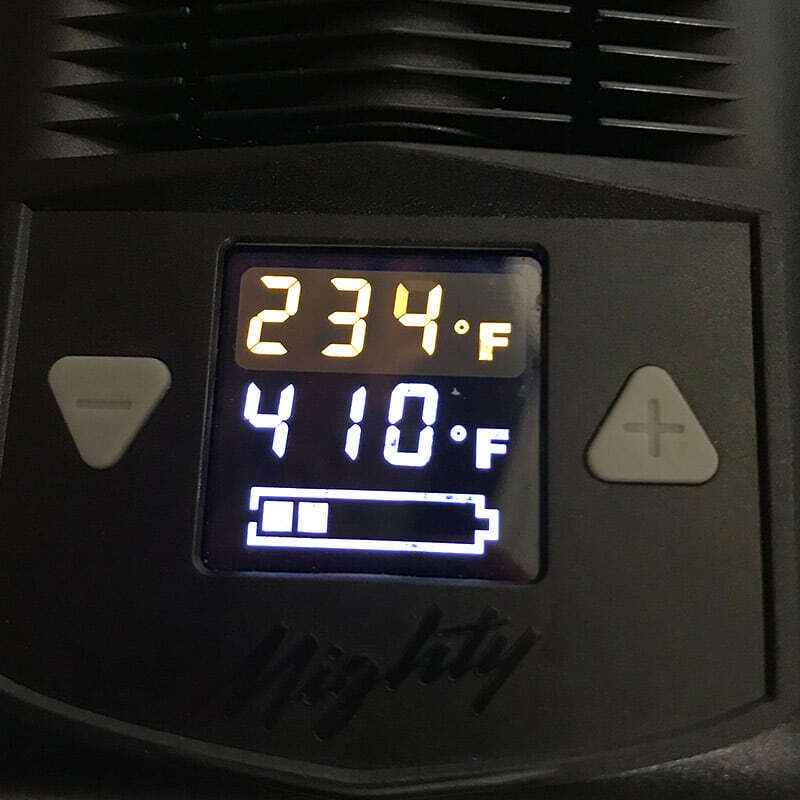 The orange number at the top of the screen is the current vape temp. 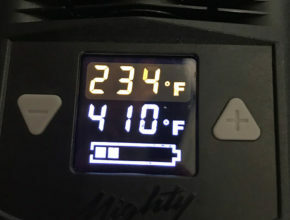 The white number at the bottom of the screen is set vape temperature. On the right side, you will see up/down triangles with a + or – sign. Use these accordingly by pressing/holding to increase/decrease the temperature. Hold down both triangles simultaneously toggle the display of Celsius or Fahrenheit. As soon as the orange number matches the set temperature (the white number), that’s the go-ahead light to start inhaling – no button pressing needed! Looking for just a slight head-change? Stay clear-headed and focused – Stick to temperatures below 325 F (162 C). Enhanced experience but staying productive? Try temperatures of 326 F (163 C) to 350 F (176 C) will be a great fit! Want a psychoactive experience? Avoid heavy sedation by staying in the ideal temperature range between 351 – 375 F.
Need relief from insomnia? Enjoy a full-spectrum psychoactive experience or relief from insomnia at temperature range of 376 – 410 F.
Temperatures on the high end will harness most of your cannabis flower’s cannabinoids and terpenes (including the sedative terpene, Linalool, which is released at approximately 390 F). You will notice The Mighty starts to produce very little vapor or a burnt popcorn taste once the bowl is finished. If using cannabis concentrates, vapor production will almost stop completely. 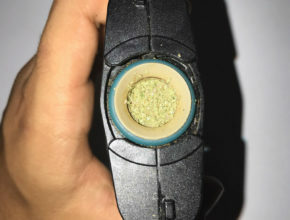 Once your session is complete, simply twist off the cooling chamber, and empty out the bowl. You may be able to reuse the vaporized flower by smoking it, making edibles, or even a topical! You can Google “AVB recipes” on Google for more info! 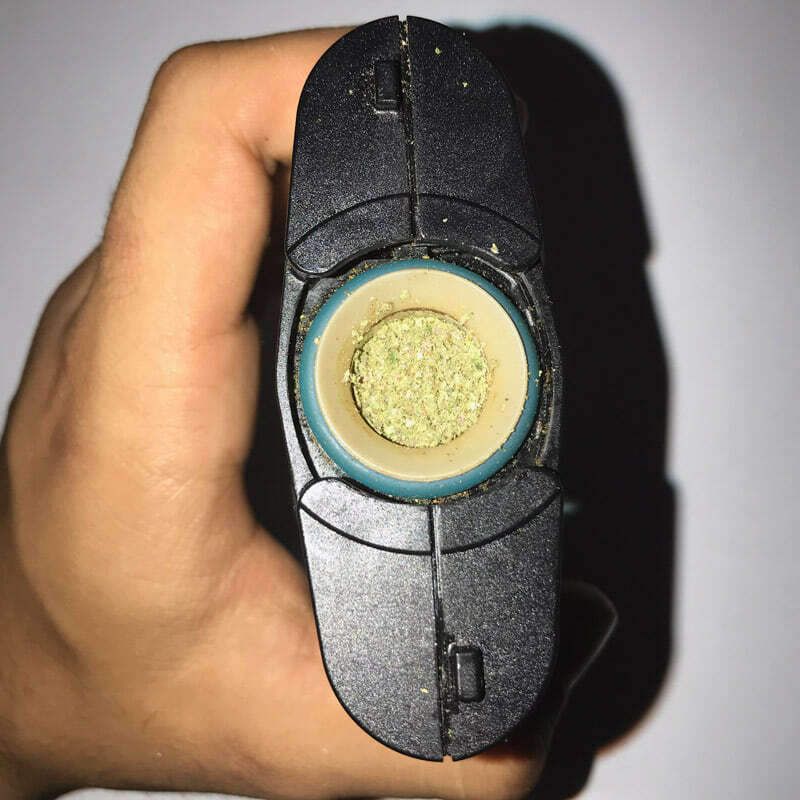 The Mighty is a fairly easy to clean Vaporizer. While the Mighty tends to build up cannabis resins fairly quick, especially if the flower is ground up super fine, it is no hassle to clean! 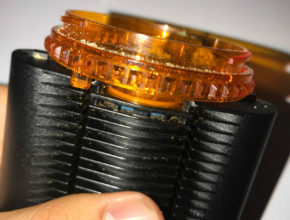 You can begin by pulling off the mouthpiece from the cooling chamber then opening the cap lock. Next, pull the cooling chamber cap from the cooling chamber base. Make sure to remove any blue rubber rings from the device. You will then submerge the cooling chamber parts, mouthpiece, and screen (not the rubber rings), into isopropyl alcohol (commonly known as rubbing alcohol). After 30 minutes to an hour of soaking, take out all the submerged pieces, and scrape remaining residue off with a pipe cleaner, Q-tip, or any material that is safe to use! Wash off the parts with water and dry it off with a paper towel or regular towel, and WA-BAM! The Mighty is clean, mighty, and ready for use! The wide range of temperatures allows us to fully enjoy the cannabinoids and terpene profiles specific to our cannabis. This makes for an interesting and unique range of vaping experiences. 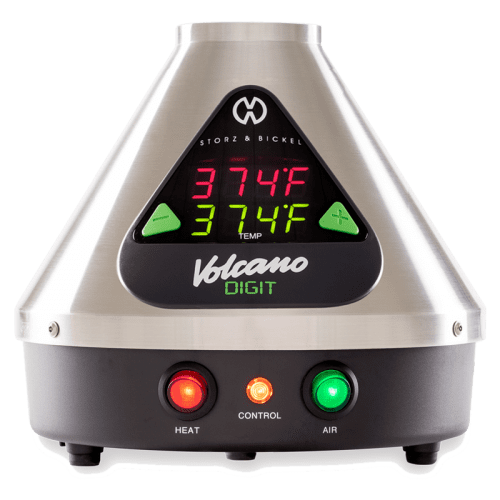 With lower temperatures, we could easily taste all of the flavor combinations; with sour tanginess at the tip of our tongue when vaporizing Sour Diesel to bursts of sweet fruitiness when vaporizing Forbidden Fruit. 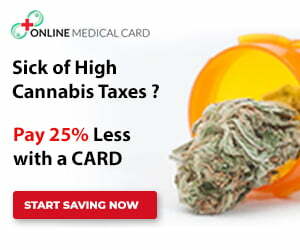 The Mighty brings out the full potency and flavors of top shelf cannabis. We’ve seen firsthand that many vaporizers tend to be inconsistent with their production in vapor quality. For this reason, dry herb vapes have developed a bad rap. 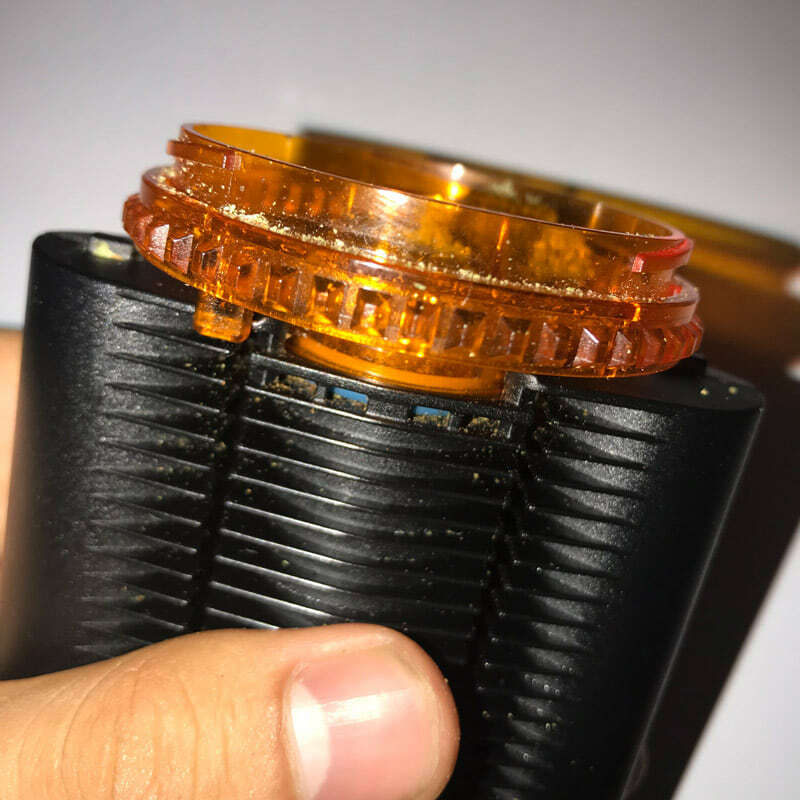 Some vaporizers fail to vape buds evenly because of flaws in their design. Issues with the airflow, vapor path or heating elements can cause hotspots and airflow blockages which lead to poor vape clouds. The Mighty, on the other hand, with its big cloud production and great airflow design, has proven to be consistent time after time. 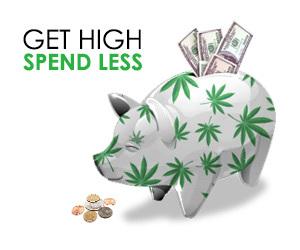 The Mighty debunks the myth that dry herb vaporizers are inefficient. Overall, the Storz & Bickel Mighty came into our hands with a king-of-vapes reputation. After our thorough testing, we can bow down to Mighty royalty. 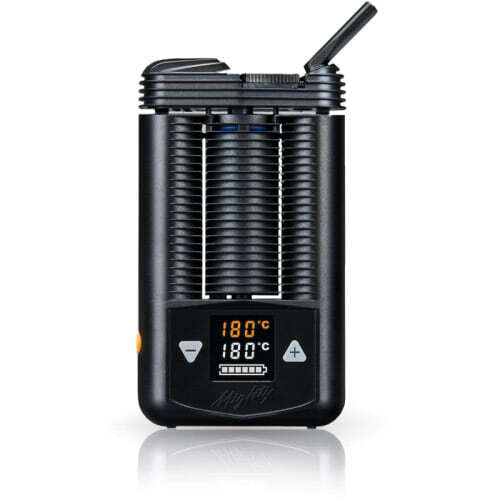 While the Mighty vaporizer is a bit bulky and lacks in aesthetic design, Storz and Bickel proves that its vaporizers deserve their Top Dog position for excellent vapor quality. We can’t wait to get our hands on more of their superior vape products to see if they uphold to the high standards set by The Mighty. 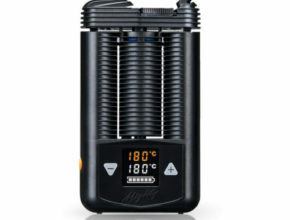 The Mighty dry herb vaporizer is available for $349 through VapeWorld and many other online retailers.